With this version of Postman, we’re pleased to announce a feature that many Cloud users have been waiting for – Environment Sharing! You can now let team members use your environments in a fashion similar to how you share collections. This overcomes the significant barrier of manually sending across environments to use in a collection. This is a Cloud-only feature – it’s only accessible to users who are on a Cloud team. If you’re not, we have a free 30-day trial waiting for you! Sign in to Postman. You should see a ‘Manage Environments’ option in the environments menu. You can choose to ‘Share’ any of your saved environments. In this example, we choose the ‘Mockable’ environment. Hitting Share lets you fine-tune the exact values that get shared as part of the template. If your environment contains sensitive info like tokens or passwords, click ‘Hide’ to prevent that value from being shared. To get to this screen directly and create a new template, hit ‘Share Environment’ in the environments menu. Confirming the template on the last screen will show you a list of templates that you’ve shared with your team. That’s it – you’re all done! 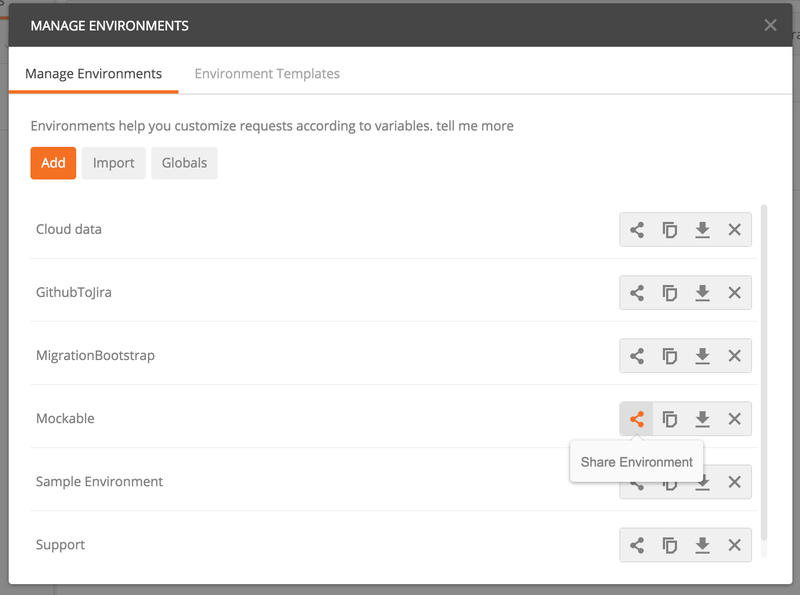 For team members to use your environments, ask them to head to the Environment Templates section in the Team Library. They can choose to ‘Add’ any of the templates that have been shared. Clicking ‘Add’ for ‘Mockable.template’ will create a local environment for them, with the values you specified while sharing. One thing to note is that updates to environments are not automatically synced. Users often update environments using request scripts, and having these changes (with potentially sensitive info) sync to all members of the team is a bit of a security concern. If you want to update the template, you’ll need to delete the old one, and re-share the environment.